Reveries of a London based mum on the psychoanalytic couch. Writing published every week on a Thursday. Allot of my writing is about the underbelly of mothering. It’s a fly -on -the -wall style look into a therapy session, an autobiographical this-is-how-I-talk-in-therapy-about-motherhood. My own history is a bit nuts. I was ‘un-schooled’ by very religious parents who saw the outside world as threatening. I was feral. The vast majority of my childhood was reading till I was numb, riding local horses in exchange for mucking out and playing in the mud with my sisters- we didn’t follow any set curriculum and I only taught myself algebra when I studied for my GCSE qualification in maths at 28. At the age of 14 my dad and mom declared they were worried about nuclear holocaust and moved us to the cloud forest in Costa Rica where we spent four years. I have survived my parents own personal apocalypse- we had a years supply of tinned and freeze dried food, I was taught how to shoot a rifle in case of emergency, and there was talk of building a bunker.My mother was chronically ill and spent most of her time in bed chain smoking and reading paperbacks and slowly self destructing and my dad was paranoid and into really esoteric belief systems and computers. My sisters and I clung to one another and took on much responsibility for the management of our home. The experience was often lonely, frightening, claustrophobic and sad, although we eventually made some friends with other North American missionary kids in a small town in Costa Rica. Then we moved to Malta for a year and my kind aunt and uncle offered to send me to London for art school, the only university that would accept my lack of formal qualifications. Being several thousand miles and oceans away from my family was liberating, as was having access to lectures, intellectual stimulation and a social life not regulated by conservative Christian values. 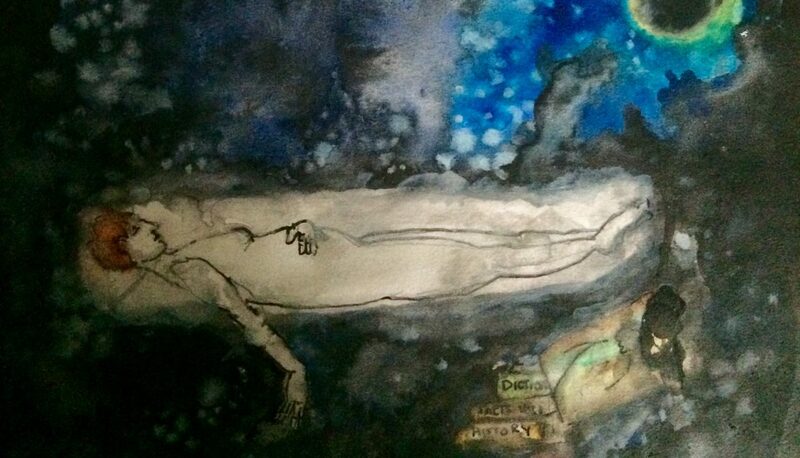 I began lying on the psychoanalytic couch after I graduated art school and the healing began. My literary diet is mostly psychoanalytic texts, poetry and essays. I have spent almost nine years on a psychoanalytic couch spilling my guts three times a week. I practice drawing and psychogeography as a way of understanding myself in the world. I write about my experience as a woman from this place, and I write autobiographically about mothering in the way I think about mothering and the way I crave mothering to be written about. I love writing. I try to be frank.